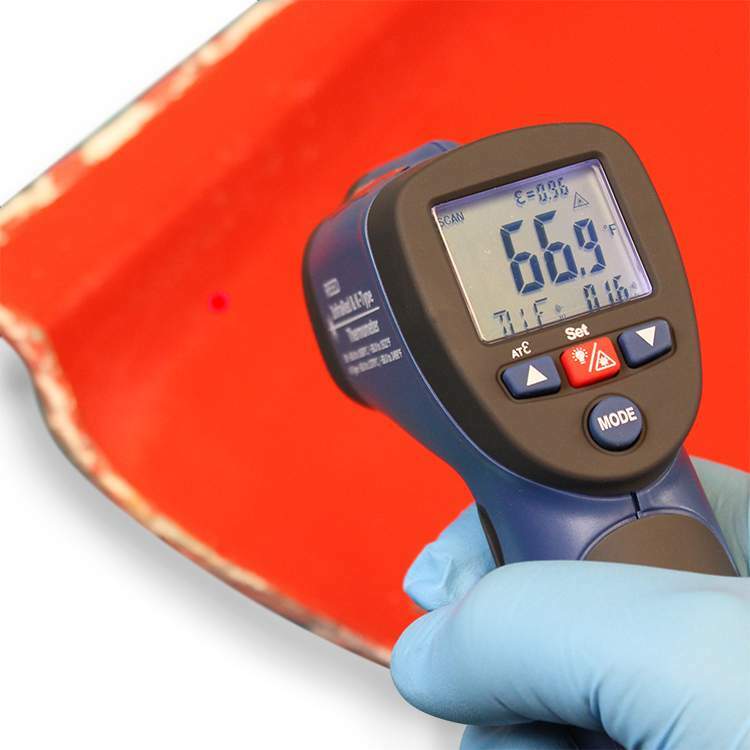 Our infrared thermometer is perfect for monitoring the temperature of your composite part during the cure and post cure processes. 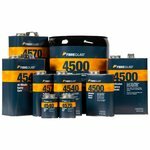 Insufficient temperatures during these processes can lengthen the cure times needed, as well as hinder the overall performance qualities of your part. This infrared thermometer is ideal for measuring the surface temperature of the substrate or mold that you’re working on. In autoclave and oven cured laminates, it is vital to track the temperature of your part, not the temperature of the oven. 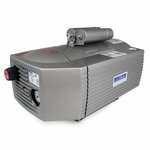 The infrared thermal allows you to track those temperatures accurately and safely. 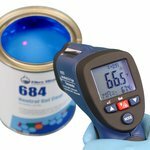 Infrared thermometers can also measure the temperature of your resins and gel coats. 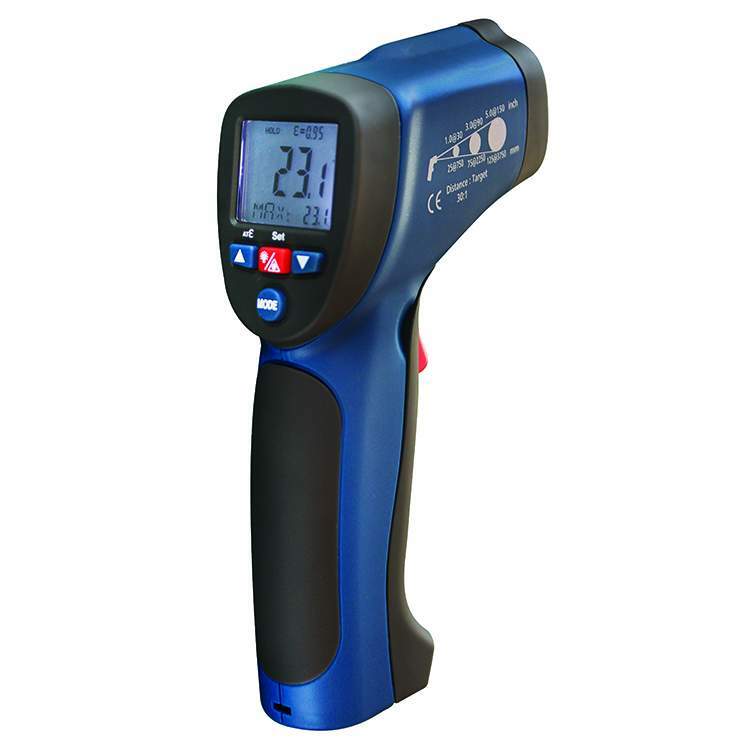 The Infrared Thermometer has a Type K thermocouple input which allows users to connect probes that measure temperatures up to 2498°F (1370°C). This infrared thermometer features a 30:1 distance to spot ratio, which means it can measure the surface temperature of your composite part at an even greater distance than similar devices. The Infrared Thermometer has the ability to track maximum, minimum, average and differential temperature readings. This thermometer also includes a trigger lock for continuous monitoring, the ability to set high/low audible alarms and store up to 20 data points in internal memory. The Infrared Thermometer is available with NIST certification. 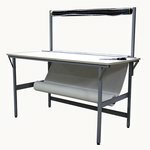 This is an assurance program that certifies that a laboratory, manufacturer or individual product is fully equipped to calibrate equipment to National Institute of Standards and Technology (NIST) standards. 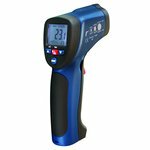 This infrared thermometer also includes a battery, type K thermocouple probe and a carrying case. The Infrared Thermometer with Type K Thermocouple is sold by the unit.